Has two functions: It can split selected layers at their layer markers, or add markers at the cut points of any layers in a comp. This can help with comp navigation and more. Watch the demo video for details on how to use it. 1. ADD MARKERS AT CUTS: Adds layer markers at the in/out points of any layers in a composition. 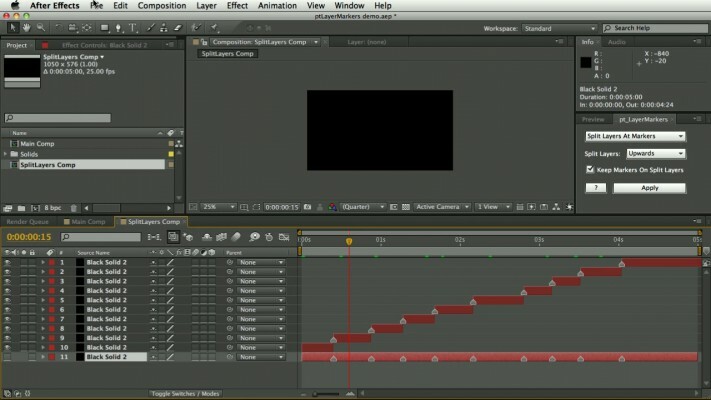 This can help with timeline navigation as you can jump between edit points using the J and K keys. It can also make frame selections suitable for pt_ContactSheet. - Choose from the following options, then click Apply to add layer markers. 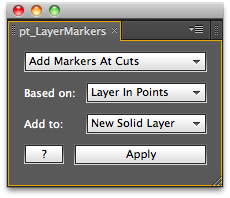 Based On: Choose whether layer markers are based on in and/or out points. Add To: Choose whether markers are added to a new solid layer, any selected layers or to nested comp layers. Markers are only added if within a layer's in/out points. 2. 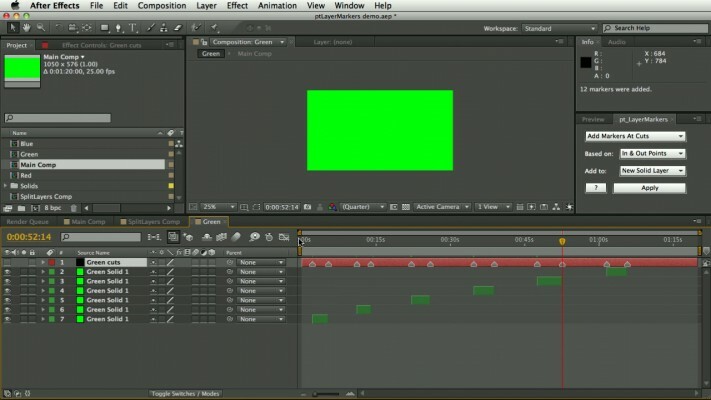 SPLIT LAYERS AT MARKERS: Similar to After Effects' built-in Split Layers feature, this will split selected layers into multiple layers, adding cuts wherever there are layer markers. Add layer markers on the frames you want to split. Choose if the split layers will be stacked upwards or downwards, and keep their layer markers. Select the layers and click Apply.